A letter John Lennon wrote to the Queen explaining why he was returning his MBE was found tucked in a record sleeve from a £10 car boot haul. The anonymous owner took the document to a valuation day at The Beatles Story in Liverpool on Wednesday - and discovered it was worth about £60,000. One expert believes the text is a draft of the letter Lennon sent in 1969, which remains in the Royal archives. He returned the MBE in protest at Britain's involvement in a civil war. The letter reads: "I am returning this MBE in protest against Britain's involvement in the Nigeria-Biafra thing, against our support of America in Vietnam and against Cold Turkey slipping down the charts." Lennon, along with the other members of The Beatles, initially accepted the MBE when it was awarded in the Queen's 1965 birthday honours, but later returned it in 1969. The letter, which was recently unearthed in the owner's attic, has been described as an "incredible find" by music memorabilia expert Darren Julien. It was originally discovered inside the sleeve of a record that was part of a collection of 45s, picked up for £10 at a car boot sale 20 years ago. 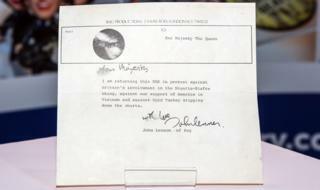 "My theory is that John Lennon never sent this draft because of the smeared ink," said Mr Julien. "If you're writing to the Queen, you want the letter to look pretty perfect, you don't want the ink to be smudged. "This suggests that he wrote a second version of the letter, which was the one that was actually sent."